JAKARTA, Indonesia, October 19, 2015 (ENS) – Fires started illegally to clear land for oil palm and acacia pulp plantations in Indonesia are sending thick smoke over the Southeast Asian region, making breathing painful, closing schools, canceling outdoor events and disrupting air traffic. Authorities at Rendani Airport in Manokwari, West Papua imposed airspace restrictions on Sunday as thick smoke from the forest fires reduced visibility to below 2,000 meters. Jakarta has sent about 25,000 personnel and water-bombing aircraft to fight the stubborn fires on Sumatra island and the Indonesian part of Borneo, called Kalimantan, but the blazes in forests and peatlands are still burning. Smoky haze rising from forest and plantation fires in Central Kalimantan Province has cut visibility to less than 50 meters. The fires happen every year during the dry season, but scientists say this year’s El Nino weather system has created dry conditions in Indonesia that are contributing to their spread. Many of the fires are burning in areas with peaty soils. Peat is a soil-like mixture of partly decayed plant material formed in wetlands. Peat fires tend to be tough to extinguish, often smoldering under the surface for months. Peat fires release three times as much carbon monoxide and 10 times as much methane as savanna fires, according to Dutch scientist Guido van der Werf, who has created a system to quantify the amount of pollution released by the fires. Indonesia rejected offers of assistance from other countries until last week, when the government decided to allow firefighters from around the region to help. An aerial response firefighting team left Australia on October 13 to assist Indonesia in its efforts to combat the fires in South Sumatra. Two aircraft, a L100 Lockheed C130 Water Tanker supported by a Turbo Commander 690B lead plane, have arrived in Sumatra and are based out of Palembang. Even so, Malaysia’s environment minister, Dr. Haji Wan Junaidi Tuanku Jaafar, warned today that international efforts to extinguish Indonesia fires will fail and South-East Asia could face weeks of smoke until the rainy season begins. “Unless there is rain, there is no way human intervention can put out the fires,” said the minister. The blazes are spread across “huge areas” of Indonesia, he said. The rains are expected to begin in December. 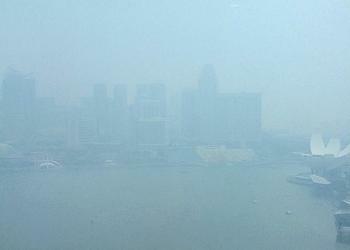 Singapore is still hazed in and residents have been living with the smoky air for at least a month. The smoke has spread to the Philippines. 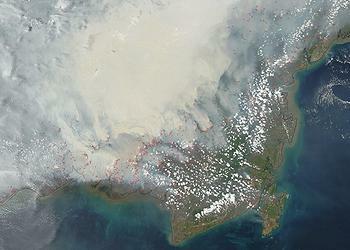 Three cities on the southern Philippine island of Mindanao are covered with thick smoke. Indonesia has revoked the land licences of PT Mega Alam Sentosa and state-owned PT Dyera Hutan Lestari, according to Rasio Rido Sanithe, director-general for law enforcement at Indonesia’s forestry ministry. Neither firm could be reached for comment. Sanithe told reporters that the fires this year have reached an “unprecedented” level. Hot spots have been mapped in 18 Indonesian provinces. On Monday, a state of emergency was declared in North Sulawesi, which enables Jakarta to help contain the fires there. Riau Province’s Forestry Department Chief Fadrizal Labay said Monday that only 22 of the 61 forestry companies in his area are ready to tackle the peatland and forest fires. Tensions have been rising between Indonesia and its neighbors as the smoke spreads. AFP reports that on Wednesday, Singapore’s biggest supermarket chain began withdrawing paper products made by an Indonesia-owned company accused of contributing to the smoky haze.